When Robert Bianco visited the New York World's Fair last summer, he was much impressed with the half-million dollar official scale model of the Fair which is housed in the American Express Pavilion. 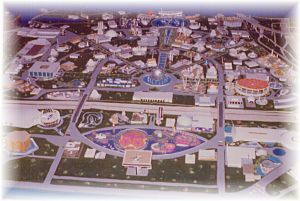 Viewing the model helps visitors to orient themselves and plan their Fair sightseeing easily and quickly. Robert, 14, was so impressed with the Amexco Pavilion model he decided to build his own. He began the project last August after taking numerous color photographs of the model, making on-site inspections and studying copies of the various other pavilions at the Fair. Using wood, clay and 150 light bulbs, Robert created an amazingly accurate and colorful replica of the official model. As visitors to the Bianco home view the model, Robert plays a tape recording which describes the pavilions. As each pavilion is mentioned on the tape, Robert, in the next room, throws a switch on a control panel which lights up the pavilion being featured. As the tape ends, Robert turns off the overhead lights, recreating the unusual effect of the Fair as it appears at night. So far, the neophyte architect has completed 125 pavilions. He has 25 more to go. The cost of Robert's project -- $30. 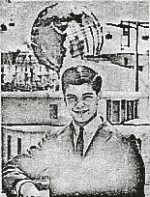 The only aid the young man received was from his father, Martin, who wired the model and soldered the light bulbs into place. A student in the ninth grade at Elmont Memorial High School, Elmont, New York, Robert hopes to become a civil engineer. In addition to his architectural talents (which come naturally -- he has had no training), Robert is an accomplished drummer and plays in the school band. "Bianco ... Bianco ... why does that name ring a bell?" 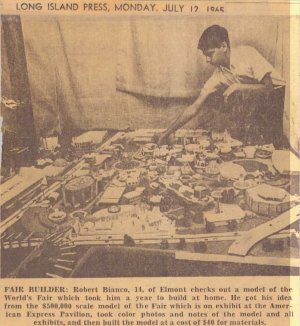 In late summer 2001, I received an email message from a friend with an attachment photo of a yellowed newspaper clipping from the Long Island Press of July 12, 1965 showing 14-year-old Robert Bianco of Elmont, NY with the model of the Fair he had constructed. 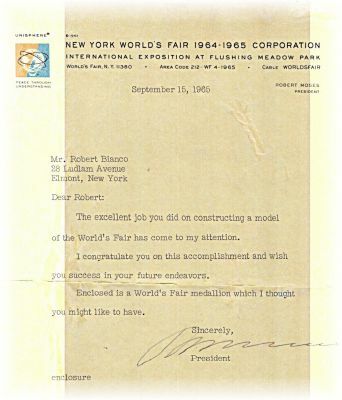 I had recently published a Feature on the Mini-Models of the Fair at nywf64.com and my friend thought I might be interested in seeing this news clipping. He'd been in touch with Mr. Bianco who had sent him the copy of the clipping I was looking at. "My story started when during one of my many visits to the Fair, I wandered into the American Express Pavilion. My eyes beheld something the likes of which I had never seen before. There, spread out in front of me was a huge scale model of the Fair. The model would have been impressive by itself, but then there were the narrative and lights. I was awestruck. At age 14, I walked out of that pavilion and was never the same again. I had always tinkered with model kits, just like most kids, but to build something like this would be quite different. I dreamt about building my own scale model of the Fair in an unfinished bathroom on the second floor of my Elmont home. "Several thoughts about this project fascinated me. First, I would build something that no one else had or could buy. Second, I loved the World's Fair and this would be an opportunity to bring the Fair home, to relive my memories many times over. The American Express official model of the New York World's Fair would be my inspiration. "I started building some of my favorite pavilions from wood, clay and paper. The unique architecture of the Fair made model making a real challenge. I found myself looking at any and all objects around the house and in restaurants asking myself the question, "does this thing look like any part of a pavilion?" I studied the official guidebook, took photos and researched any information I could find that would serve as a resource for my model. The first roadblock occurred when I attempted to illuminate the pavilions. The thickness of the wood and clay made lighting the buildings impossible. My aunt Celeste, who lived in Manhattan, was able to purchase several large sheets of plastic, which I was able to reshape into World's Fair pavilions that could be lit from inside. I also discovered that by remaking the buildings they would look better on the second attempt. By the time the model was complete, not one original building remained. Most models were of the third or fourth generation. Even the photo of the model that appeared in the paper was not the final version of this project. "How I ended up with my picture in the paper is as much a story as making the model itself. After several months of sheer model making pleasure, I had a pretty good replica of the Fair with pavilions that could be illuminated. The only thing I was missing to make the experience complete was the narrated recording from the American Express Pavilion. This recording named the pavilions and spoke briefly about each one as they would light up. It was quite a show. The 20 x 40 foot model was located on the floor and when it lit up it made you feel as if you were in an airplane flying above the Fair. But how to get a copy of this recording? "My very supportive father took me to the Fair carrying our reel-to-reel tape recorder with the intent of tape recording the narrative. You might imagine my disappointment when we arrived at the pavilion to find out that there was no electrical outlet in the room. (Battery operated tape machines were not available back in 1964.) I was depressed and very upset and told my father that I just wanted to leave. He noticed how visibly disappointed I was, and wasn't about to leave that easily. He suggested that we ask someone who worked at the American Express Pavilion if we could somehow make a copy of the recording. It was at this point that he spoke one of his many words of wisdom...a lesson that I continue to experience throughout my life. He said, "Let's just ask someone...we have nothing to lose by asking." I was reluctant at first and somewhat embarrassed at the thought, but my father prevailed and proved to be right again. "Before I knew what was happening, we were being escorted to the VIP room on the second level of the pavilion. From a small viewing room I was able to look down on the Fair model and make the recording that I had wanted so very much. As we were getting ready to leave the pavilion, the American Express employee asked what we wanted the recording for. I told him what I had built at home and he was so intrigued by it all, that he said he wanted to come and see it and bring a photographer with him. Several weeks passed and the day came when we had these special guests in our home. "All I could say was WOW!!!! "In 1986 I was living in Fayetteville, Arkansas. I was working as the Administrator of a Retirement community when one of our part-time employees called me to say that she had something very interesting to show me. It so happened that this employee also worked in the local bank. One day a couple visiting from Clovis, New Mexico came to the bank. They had a newspaper clipping of their wedding from 20 years ago. Because the paper had aged, they wanted to know if the bank could laminate their clipping. She told them that she could do that for them, and proceeded to do so. In the process, she turned the article over to fit it into the machine. Can you guess what was on the other side of that article? The same article that had appeared in the Long Island Press in 1965! There I was, halfway across the United States and 20 years removed from the event that now reappeared before me. I cannot fathom just what the odds of this happening are, but I can tell you that it was the most amazing thing that ever happened to me. To think that my little article had appeared in the Clovis, New Mexico newspaper made me wonder just how many other papers it might have appeared in." Rob never knew that American Express published the story about him in the Going Places company magazine so it was a treat for me to be able to send him my copy to add to his scrapbook and to be able to tell him that his story had once inspired me to attempt my own model construction -- a project that was not nearly so successful as his own. The one thing he didn't construct in his model was Unisphere. Instead, he used one of the best quality miniatures sold at the Fair that stands about 3 1/2 inches tall (a scale of about 1:500) and everything else was made in scale to it. 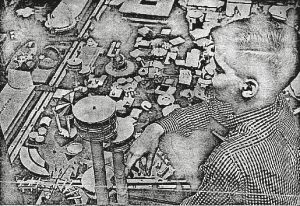 He used the Esso Map of the Fairgrounds to determine the plot sizes and the grounds layout. "The kid from Elmont went to the Fair on the closing day...at the end of the day I went up in the New York State Towers (my favorite pavilion) for the last time and then left the Fair feeling very sad about it....As soon as it reopened as a park I revisited the site many times. However, the greatest park in New York City that Robert Moses had envisioned was never to be. In 1975 I married and we moved to an apartment in Mineola. The model stayed in my parents home. I moved several times over the years living in Virginia, Arkansas and now Florida. My mother passed away in 1986 and my father joined her in 1988. But before my father died, he sold the house and moved to Connecticut to be near my sister. When he sold the house, he had to demolish the model. He saved a few of the buildings and sent them to me. "I have vowed to rebuild the complete Fair model again, and I believe that I will do this sometime in the very near future. I have always made models (many from scratch) and because of many years of modeling experience I believe that a model I would make today would be infinitely better than the one I made as a teenager. 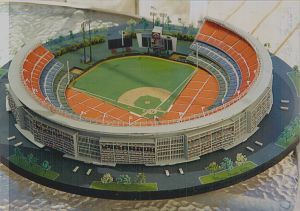 I still have the Unisphere, the New York State Pavilion, General Motors, and while it was not part of the Fair, a model of Shea Stadium as it appeared during the Fair. Many out of state visitors thought that Shea was part of the Fair -- I still remember overhearing people asking, "What is that big pavilion over there?" 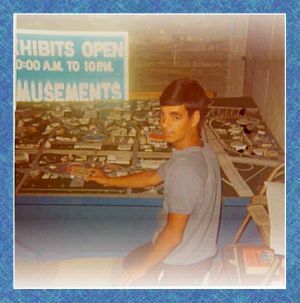 Today, Rob is a Licensed Nursing Home Administrator in Central Florida, not the Civil Engineer that he had planned to be way back in '64 when he was a 14-year-old Elmont, NY boy building models. But one thing that hasn't changed is his interest in and love for the Fair. Rob's story is representative of thousands of stories of kids who were so fascinated with the Fair, they wanted to keep a part of it forever. That is an enduring story of the Fair!